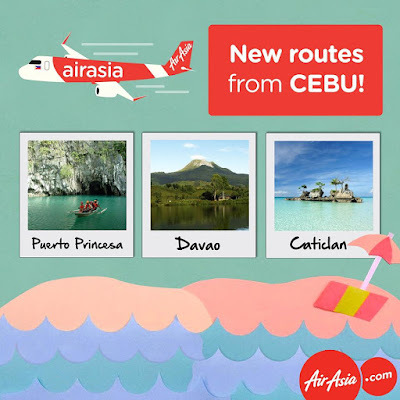 Aviation Updates Philippines - Budget carrier Philippines AirAsia is launching new routes from Cebu and Davao in summer 2017. The airline will be adding four new leisure routes, and will be relaunching previously operated routes to cope with the increasing passenger traffic to top tourist destinations in the Philippines. NEW ROUTES FROM CEBU. Philippines AirAsia will be flying to Puerto Princesa, Davao and Caticlan starting April 22, 2017. The launch is just in time for the summer peak season. From the Cebu hub, Philippines AirAsia will now be flying direct to Caticlan daily, Davao twice daily and Puerto Princesa daily starting April 22, 2017. Flying out of the Davao hub, the airline will now be flying to Caticlan once a day and Puerto Princesa thrice a week. 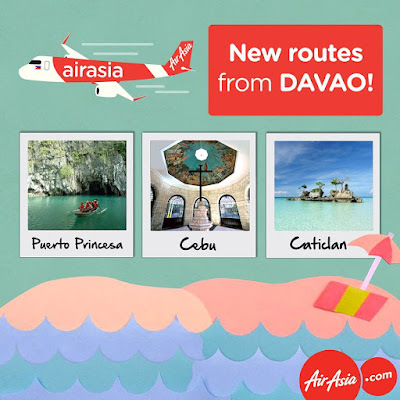 NEW ROUTES FROM DAVAO. The budget carrier will also fly direct from Davao to Puerto Princesa, Cebu and Caticlan starting April 22, 2017. On the other hand, the airline will resume its Clark to Davao service on April 23, 2017. Davao and Cebu will be reconnected when AirAsia revives its twice daily Davao to Cebu route. On the other hand, the budget airline will also revive its Davao to Clark service, which it last operated in 2014, on April 23, 2017 flying four times weekly. However, all flights to Caticlan from Manila, Cebu and Davao will end on June 18, 2017. Philippines AirAsia is only taking advantage of the increasing passenger volume for summer 2017. Although the airline is scrapping its direct flights to Caticlan, it will still operate flights out of its Kalibo hub. Note: DVO-PPS route not included in the timetable. Timetable provided by Aviation Updates Philippines. Philippines AirAsia currently flies domestic and international flights out of Cebu and Davao. AirAsia flies to Manila from Davao and to Kuala Lumpur, Manila, Seoul-Incheon, Singapore, Taipei-Taoyuan from Cebu. It operates an all-Airbus fleet which consists of 14 Airbus A320-200 aircraft.